With today being Monday and I was not wanting to get up early to start my work, I knew I would be working overtime tonight. Overtime = Perfect time to use the crockpot. My workload each day is based on how much work my unit produces the day before so if they process a lot then I have a lot to audit. So my crockpot sure does come in handy when I know I will be working late. Today I cheated with my crockpot meal. I used a Campbell's Oven Sauce, Creamy Garlic Chicken. I have used it in the oven before but today decided to try it in the crockpot. I did add 1 C chicken broth that I normally do not add when I bake it in the oven. I was afraid it might be dry or the potatoes might not get as soft as I wanted without more liquid. 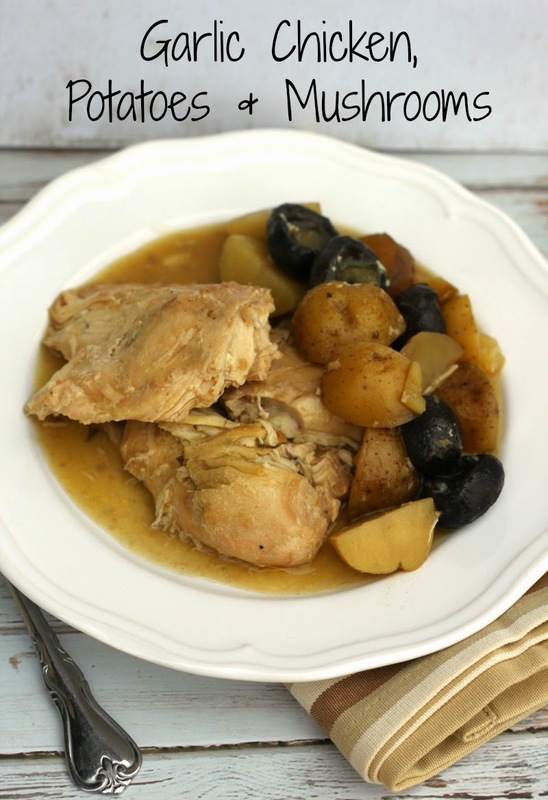 This meal is super easy whether you are doing it as the recipe calls for in the oven or putting it in the crockpot as I did. 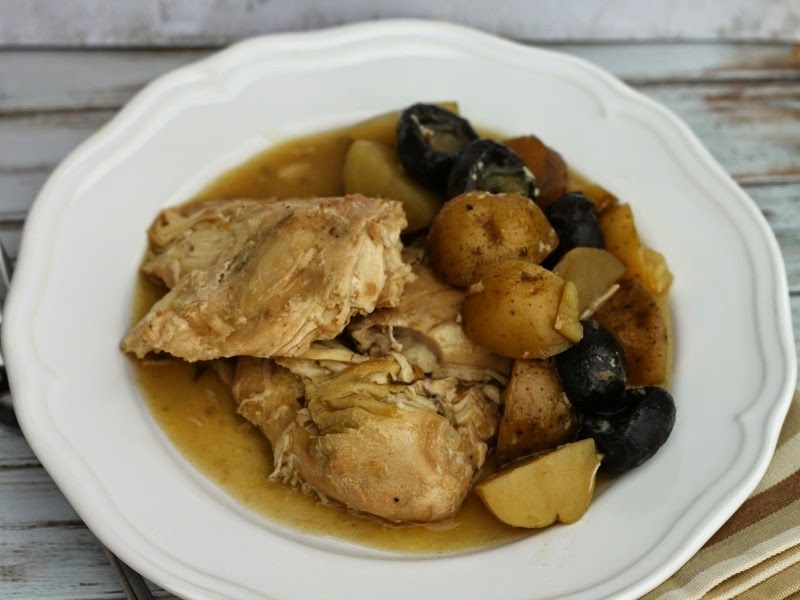 I did use my crockpot liner for this dish and it was another awesome clean up! 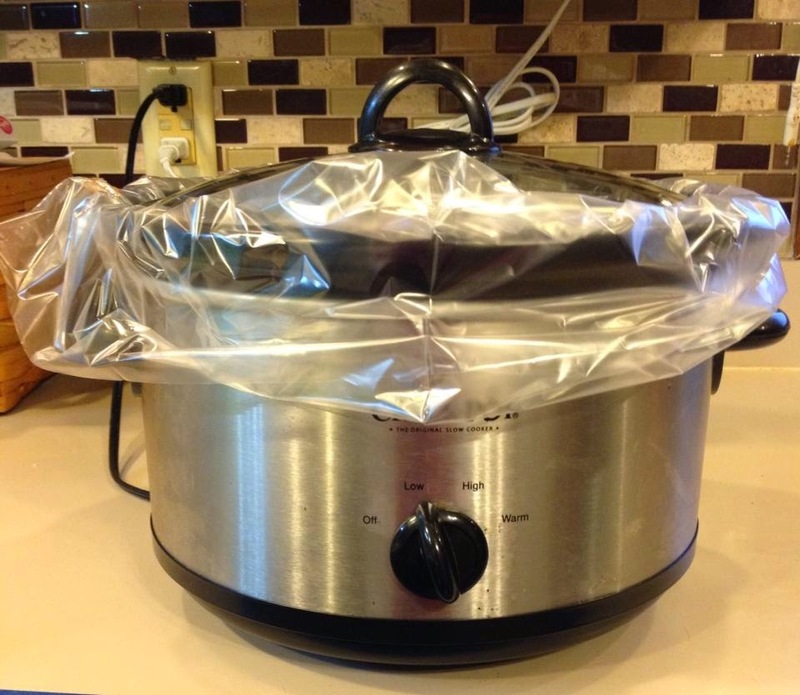 Just take the liner out of the crock pot and you are done and ready to use the crockpot for the next time. I used new potatoes in my dish but they were still a little larger than I wanted so I did cut my potatoes in quarters before I put them in the crockpot. I also took the stems out of my mushrooms but you can leave them on if you prefer. I love mushrooms anyway they are fixed but these with the garlic sauce are super delicious. The Package calls for potatoes and frozen green beans but I prefer garlic mushrooms over green beans. Place liner in crockpot (if using a liner otherwise I would spray with cooking spray) lay chicken in crockpot, place potatoes and mushrooms around the edges of the chicken (they will eventually be floating all over the pot) pour in the chicken broth and then lastly put the Campbell's Creamy Garlic Sauce over everything. The sauce is thick like soup but as it cooks in the crockpot it melts down and everything combines into a creamy goodness! Cook on low for 6 to 8 hours, until the chicken is at least 165 degrees and the potatoes and mushrooms are tender.